Do you love camping but hate all the creepy crawlies that can get in your tent? Is it always a problem when it’s raining and you have to find the perfect spot to set up your tent, where no water can get inside it? Well, the solution for your problem is simple: tree hanging tents can fix all these issues for you. Apart from solving your insect and wet ground issues, a tent that’s designed to hang from some tree branches is safe, portable and easy to set up. These tents are better for warmer weather, though, you can’t really use them in the winter, but otherwise, they’re quite versatile. You can even use them in your own backyard as a treehouse, or you can take them camping for a wonderful, safe, insect-free experience. So where can you find such magnificent pieces of gear? You’re on the right page because we have 7 such cool tents lined up for you. But first, we’re going to discuss the most important characteristics that influence your choice. And all that is synthesized in the table below, so come back to it once you’re done with the article. Your purpose is the most important factor for choosing, so you should have a very clear idea of where you’ll be camping, with whom and for how long. You should also know if you only need this tent for camping or for home use too. If you’re going alone, with just one other person or if you’re already carrying a lot of stuff with you, portability should be your top priority. That means you’ll have to look at a lightweight and compact tent so it won’t become too much of a burden. On the other hand, if you can share the load with other people in your group, or if you’re going by car near or up to the campsite, you might sacrifice portability for other more important characteristics. But generally, these tents don’t weigh too much because they’re not extremely warm, so the warm weather materials are quite light. However, it’s also true that a bigger, more spacious tent will have bigger overall dimensions even when packed, as well as a bigger weight. There are two main shapes you can choose from: the pyramid shape and the conical shape. The first one means you’ll need three different hanging points, and most of the times these have to be at an equal distance from each other. So make sure the tent you’ll get can actually be set up at your campsite. Not every such tent requires three equidistant hanging points, and some can even be placed in dense forests. The conical tents require just one hanging point above. The disadvantage is that they have a smaller floor, so they’re less capacious than the pyramid-shaped tents. These are therefore better in terms of setup versatility, as well as portability, but they lose points regarding the room. The pyramid-shaped tents are better for accommodating more people, about two or maybe even three individuals because they have such a wide floor. That might be important for you if you’re camping with your significant other, your family or a friend. Conically shaped tents can only accommodate one grownup or a few children, but that’s only because they have a smaller floor. They still allow a pretty big maximum weight, so you can definitely use such a tent with someone you don’t mind getting intimate with. You should have a pretty good idea of what that maximum allowed weight is so you’ll know if you can actually fit inside with all your luggage without the risk of falling. If you respect this maximum weight, the included straps will surely hold because these hanging tents are generally quite resistant. You should also know if your tent is resistant to water, and that means having a waterproof top. Otherwise, rain will get inside your tent and that’s definitely not something you want unless you’re fine with simply taking down the tent each time it rains or camping just in warm, dry weather. And if you hate flying insects as much as you hate the crawling ones, make sure the tent has an insect-repellent coating. How comfortable your stay is inside the tent should be a priority, particularly if you’re using it for a prolonged camping trip. Otherwise, you can probably get away with sleeping cramped for just one night. So floor space is definitely an issue to take into account here, but that’s not the only one. Make sure you get a ventilated tent, so a mesh roof and a couple of windows are particularly important especially during summer. It’s also nice to get a tent with two doors for extra ventilation, as well as for privacy or stepping out of the tent without bothering the people you’re sharing it with. With that in mind, let’s see what the market has to offer us. We’ve selected only quality items which we’ll discuss below. These tents you’ll read about here have different unique features that singularize them for different purposes. That’s why we’ve summarized all their most prominent specific features, discussing them in terms of their best uses. And you’ll also find the pros and cons of each product, so you can compare, contrast and make the wisest decision. Description: The Apache Naki Tent is a two-person tree house that’s great for hot weather camping. The first reason is that this hammock-tent combo isn’t manufactured from a very warm material, though it can be used in rainy weather too. Secondly, there’s a mesh roof there which is great for ventilation, but not so great for the cold. Another great characteristic is that it’s quite light, so you won’t have any issues with portability. It’s even compact enough when you fold it, though the almost 40 square feet sleeping area is accommodating enough for two people. The maximum allowed weight of 560 pounds is also good for two people, even if you have hefty backpacks. The design glitch we’re most surprised at is its rainfly. This simply hooks on itself, going around all the straps, though it would have been much more secure with guy lines. Other than that, there aren’t many problems with the tent, though the Apache user service isn’t the best on the market. And since you’re probably considering a hanging tent, chances are you might want to escape insects and bugs that crawl on the ground. 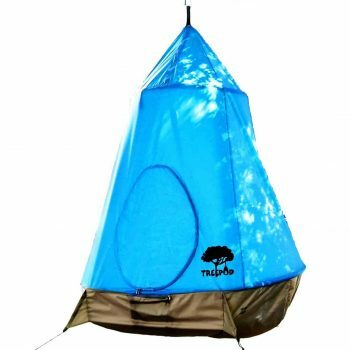 This tent also helps you get rid of those that might fly into your tent since the mesh roof is coated with insect repellent. We love how versatile and convenient this tent is too. There’s a waterproof top in case it rains, and there are two entrances you can use, you can even keep your backpacks there. Don’t forget the included hammock straps that are included in this package, which are really sturdy. Related: If you love spending time in the great outdoors at some elevation from the ground, then the Silverton Outfitters Camping Hammock is a nice addition to your backpack. This hammock is made from a heavy-duty nylon, so it’s durable and water resistant, being able to hold up to 450 pounds. But don’t forget to get the best hat for sun protection if you’re not using it in the shade. 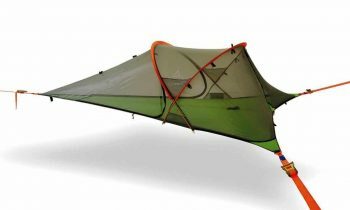 Description: The Tentsile Connect Tree Tent is a more expensive tent, but it also has some unique features that set it apart from its competitors. For instance, it has a modular design that not only looks good but also improves its setup time as well as portability. But the truly amazing feature is its ability to connect to other such tents manufactured by the Tentsile brand. That means you can actually create an apartment of tents, so you can move from one to the other and have a huge communal space at your disposal, for storing bags or for enjoying a meal with your friends. You can still use it for a two-person trip, though, even if it’s heavier than the previous tent we reviewed. We love how versatile and accommodating this tent is, it’s really comfortable to sleep in it, and the four inner pockets are a great addition to storing and organizing your gear. And if you peg out the flysheet, you can actually double your space. You’ll get two poles included in the pack, made from aluminum Featherlite, a strong yet light enough material. The canopy is made from polyester mesh, which means it’s quite a breathable tent too, but the zero footprint is what appeals to us the most. Unfortunately, the rainfly doesn’t cover all the tie out points, which means you’ll probably need an additional piece of rainfly for that. Related: The Tentsile Webbing Ladder is just what you need to get into this tent. It’s not an expensive product and it’s designed and manufactured by the same brand, so you’ll know it will fit your tent. Besides, this great ladder can be used with other hanging tents as well, and it’s easy to set up. 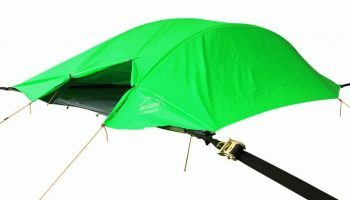 Description: The Uboway Triangle Hanging Tree Tent can be purchased in two different shades, either a vibrant green or a more stealth Camo if you’re hunting. Regardless of the hue, the design is quite amazing. This is a very light tent that can be packed into a tiny pack, so it wins plenty of portability points. And when you unfold it, you’ll find it offers plenty of sleeping room for two people. And it also supports a lot of weight, 882 pounds is more than enough for two people and their backpacks for a week of camping. The mesh roof is something else we like since it’s coated with insect repellent just like the Apache Naki Tent, so you can get some much-needed ventilation without any insects flying in your sleeping area. Besides, there’s a waterproof top here too for rainy weather, and the entrances can be used for storing purposes. The setup is fast, easy and versatile too, you just need the three hammock straps and the one ratchet included in the pack. This tent can be set regardless of how the trees are placed in a certain area, so you can even set it up in a cluttered forest. So the only downside to this tent is that it uses a mix of 190T polyester and 210D oxford fabric, which is prone to scratches if you’re not particularly careful. Related: If you’re a fan of versatility, then you definitely need the HAITRAL 2-IN-1 LED Tent Light Fan. As you probably get it from the name, this device acts both as a bright LED and a ceiling fan, so you can keep your tent illuminated and ventilated with the same gadget. What could be better? Description: The TreePod Hanging Treehouse has a different design than its peers, with a conical shape, though that means it offers less space than the other items we reviewed here. However, it still holds a decent amount of weight, up to 500 pounds, even if the tent itself is just 5 feet wide. So this is a great treehouse for your kids, but it can even be used by a grownup or two. That said, it’s fairly easy to set it up, it just needs a couple of minutes so it’s much easier than actually building a tree house. It’s also safe since you just need one fixed hanging point that’s resistant enough, like a tree branch. With its steel quicklink and sturdy webbing, you can rely on its safety. Besides, this tent has a UV-coating that means it offers sun protection too. However, the fabric isn’t fully waterproof, just water resistant. The zip-up door is easy to use too, while the mesh windows contribute to its improved ventilation. On the other hand, these windows aren’t designed so great, and the drainage isn’t great either. That’s because the water can get inside the tent from the top section, and it doesn’t drain out by itself, so you’ll have to do the cleaning and drying up if you leave it outside when it’s raining. Related: If you don’t have a fixed hanging point to hang this tent from, you need the TreePod Stand, which is manufactured specifically for this tent. It’s sturdy, the package includes all the needed hardware, you can keep it out even if it’s raining, and it’s also easy to set up, which are all terrific purchase reasons from our perspective. 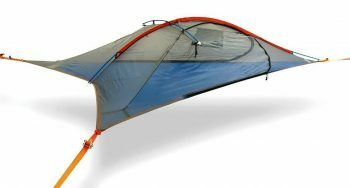 Description: The Skysurf Triangle Hanging Tree Tent is a light enough tent so you can carry it hiking or backpacking, but it can also be great for camping at the beach. You can use it for yourself and for another person, though it’s not the most accommodating tent in its category so be prepared for some intimate snuggles with your partner. So even if it’s not really a large tent, it still holds 550 pounds max, which is really enough for two people and a few bags. These bags can easily be stored in the entrance areas that are great for ventilation too. Besides, you won’t have to bother your partner when you get out for a wee in the middle of the night. The mesh roof is another strong point in its favor since it’s been coated with insect repellent. The top is waterproof, so no water can get inside your tent, though this isn’t the sturdiest tent on the market. So no jumping inside it, ok? We love that the package includes everything you need for a fast, easy setup, like the hammock straps. You’ll also get an easy-to-mount rain protection, which is terrific for rainy weather or setting your tent close to the beach. Related: If you love hiking in general, or if you’re hiking now to that perfect beach where you can mount your tent, you need some reliable hiking poles. So why not consider the Foxelli Trekking Poles? These are light, ergonomic, anti-slip and you can use them on every terrain, even in inclement weather. Have you fallen in love with them yet? Description: The Tentsile Flite+ Tree Tent is another cool-looking pyramid-shape suspended tent that can be purchased in a plethora of different colors, depending if you want to attract attention or not. So you can easily get a psychedelic green if you want to stand out, or a more tempered camo if you’re going hunting for instance. But regardless of the color, you’ll be getting a reliable tent that’s fit for two people. You’ll also be enjoying the two doors it sports, particularly if you need to get out without bothering your partner. And since this is a conveniently-weighted tent, you can rest assured it won’t prove a load while you’re backpacking. The cross brace it has is amazing in terms of how much space it provides since now you have additional headroom. That’s a great bonus for tall people. But it’s still better for people under 6’1” and under 485 pounds. The overall construction is great, though. It can even be placed in a dense forest, it has an insect-proof mesh, a removable rainfly that’s UV resistant and PU-coated. And if you fold this under the tent, it will act as a great insulator both from the wind and from the cold. However, one downside is that you need to find three trees that are at an equal distance from one another. Another disadvantage to this tent is that it allows condensation to form during the night, and it’s pretty difficult to take it down without it touching the ground. Related: The PeakAttacke Outdoor Camping Lantern look great for different camping or hiking trips. They have an awesome design too, which allows you to hang them or hold them in your hand, they’re very bright and resistant, not to mention they’re eco-friendly too. So if you need something to light up your tent, this is definitely one of the best lanterns on the market. Description: The Tentsile VISTA Tree Tent is great for fishing and hunting since it’s actually the most resistant hanging tent in our review. It’s also the biggest one here since it can easily accommodate 3 people thanks to its 75 square feet floor. However, the downside is that it weighs quite a lot, so it’s not that portable and the three included aluminum poles contribute to that. In terms of construction, the bug mesh is simply great. Thanks to this, there won’t be any creepy fliers getting in your tent, but you can also take this mesh down if the environment and weather allow you to. That’s because this is a two-season tent, so you can use it in colder, windier and rainier weather too. The flysheet is a nice addition as well, and the polyester mesh canopy is quite enduring. Not to mention that these materials don’t pollute the environment, so you’re ending up with an eco-friendly product too. There are four inner pockets for storing your gear and don’t forget that you can peg out the flysheet for extra room. Related: If you’re out fishing or hunting, you still need the best hat for sun protection on the market. So the Coolibar UPF 50+ Men’s Reversible Bucket Hat is just the thing you’re looking for. With a high UPF 50+ sun protection and wide 3-inch brims, this 100% polyester-made hat can become your best friend for sunny, windy weather. In this article, we’ve taken you through a series of factors that influence your purchase decision, as well as a list of wonderful hanging tents. So we’re curious which one you’ll pick. Will you go with a conical tent like the TreePod Hanging Treehouse that’s great for kids as well as a short camping trip, or do you prefer a more spacious tent like the Tentsile VISTA, which is also better for inclement weather? Where will you use this tent? What are the things that convinced you? We’d love to hear your opinion on this article, so leave us a comment below.